Anyone that knows me, can say for sure my favorite drink is tea. I prefer iced tea, but on cold nights (doesn't happen often in Florida) a cup of hot tea will work. SO, When I saw this stamp set from Darcie's called Coffee, Donuts, Friends I had to get it. SO, using my favorite colors this became my newest bookmark for my collection. This is awesome, Mimi! Thanks so much for sharing your talents with us all. Have a blessed week! I just love, make and use a lot of bookmarks. And this one is so sweet, cute digi set and papers too. Love this pretty bookmark! So much fun! Awesome, love all the green! 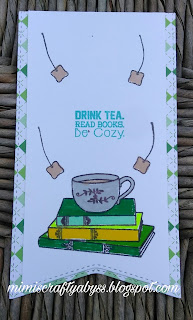 Tea and books go together perfectly! Love your card! Hi Mimi, this is just darling! Love that you made it a banner shape. Adorable and funny tag!!! Love it!!! 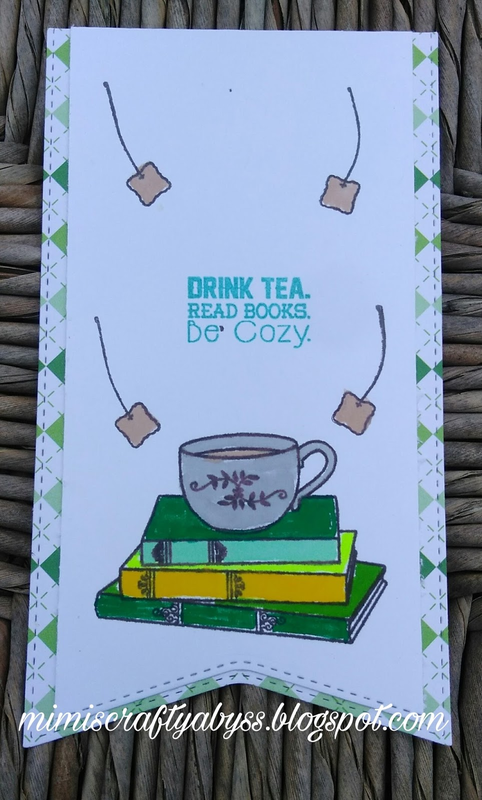 I love the theme of tea and books. Great combo and your design is wonderful.